Unlike most phones shown at MWC, the Galaxy Fold was kept in a protective glass box, which prevented visitors from getting their hands on the device. Despite the casing, we noticed a crease in the middle the display, which isn't a surprise given the panel is covered by plastic and not glass. Indeed, every time the handset is opened and closed, the plastic gets bent and creases over (a short period of) time. However, there were no unofficial videos of the Galaxy Fold available online to confirm this until one surfaced yesterday. It reveals more about the phone, including a very noticeable crease in the screen. In what seems like a promotional video for a Vietnamese network-unlocking service, we get to see more of Samsung's new foldable device and get a better idea of its proportions and how it holds in hand. The inner screen is, as expected, relatively large, while the outer one is ridiculously small, especially compared to the overall surface available. In terms of thickness, the Galaxy Fold looks great when set on the table, but is clearly bulky when closed. Lastly, but more importantly, what's most noticeable is the crease in the middle of the screen, which wasn't visible in previous videos and renders. Although this is expected to happen after about 10,000 openings, this unit appears to be new, and shouldn't have this imperfection so early. It's been said Samsung could replace ridging screens for free, but I don't see the point of doing this if the new device will crease as soon as I get it. However, let's not assume too much based on a single video and wait a little longer to see more of the Galaxy Fold. Indeed, as the video comes from Vietnam, where Galaxy flagships are manufactured, we could be looking at a pre-production unit or a defect. 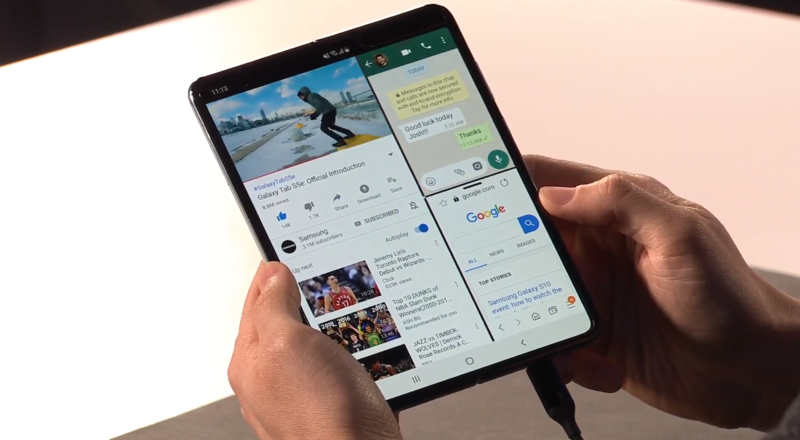 In any case, the video does confirm foldables aren't fully ready yet, and we'll probably have to wait until bendable glass becomes widely available to get our hands on ridge-free folding displays.